"What is the role of religious faith in our lives – how it can both unite and divide us?" I am so glad I finally got to see this play "Next Fall", that Flow Galindez has been telling me for so many times. He is so much excited for this play actually. That is why I am so glad that I was one of the chosen bloggers to see the preview of this play. "Next Fall" was written by playwright Geoffrey Nauffts. It is a very moving story of Luke and Adam, a gay couple agonizing over differences in their religious faiths. The play portrays the ups and downs of this unlikely couple’s five-year relationship with sharp humor and unflinching honesty. And when an accident changes everything, Adam must turn to Luke’s family and friends for support and answers. "Next Fall" paints a beautiful and funny portrait of modern romance, asking the hard questions about commitment and faith. But ultimately, simply, it is about the transformative power of love. As you can see, part of it is a love story between two gay men and their differing religious beliefs in addition to the friends and family around them that are woven into a beautifully written script. I a so much excited to see this play on January 13, 2011 at On Stage theater, Greenbelt 1 because as I can see, this play is simple, beautiful, and really moving; even though I just only saw some of the scenes of this play. You will really notice here the obvious and witty dialogue from the usual roll-call of gay characters - the ditsy mom, the distant father and the brooding best friend. 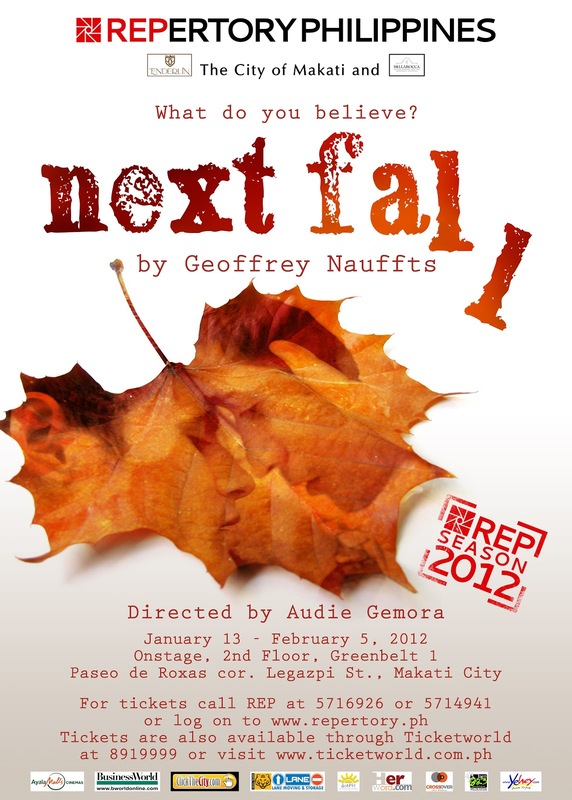 Not everyone will relate to the homosexual relationship and not everyone will relate to the various religious stances held by the characters in the play, "Next Fall." What everyone will relate to, however, is the common denominator of religion in our lives and how it influences our views. That is why this is not just your ordinary gay-love story. When a play presents two gay lovers, one Christian and the other atheist, the audience may lick its lips for a meaty philosophical debate with a modern twist. This play was said to disguise as a tragedy about two men with irreconcilable views of the world, “Next Fall” has nothing to do with God or science. David Bianco & Bart Buingona will play the two gay men in the "Next Fall"
"Next Fall" is not just your ordinary gay love story. It is also about how people exaggerate the importance of those oppositions and sacrifice love in the process, but it is also about learning the lesson that while next fall might never come, the certainty of the here and now can (and will) suffice. This play will surely entertain us but will wear its heart on its sleeve and nowhere near scratches the surface of the fascinating subject matter.